New Orleans flavors. Gulf fresh cuisine. Welcome to Elysian Seafood, where we bring our guests on a journey through the waters of the South with our fresh, locally sourced menu. Inspired by the flavors of New Orleans, our diverse offering of Gulf Coast seafood has all the freshness and flair you could want in Louisiana cuisine. With two locations in New Orleans, we’re known for serving up dishes like our sizzling charbroiled oysters and succulent Louisiana crabcakes. When you join us for a meal in one of our upscale food hall spaces, you'll find a knowledgeable staff that will help you select the perfect menu items for your taste. We're passionate about creating elegant but approachable seafood dishes that are filled with the spirit of New Orleans, and we look forward to sharing that passion with you. 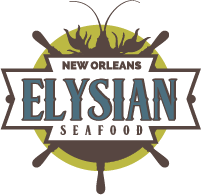 Feed your inbox with exclusive promotions and updates from Elysian Seafood. ©2018 Elysian Seafood. All Rights Reserved. Site handcrafted by Deep Fried.